I love "When Animals Attack" films. I just love watching a group of people running away from a pack of dogs or watching some hikers being attacked by a bear. There is something about these films, I don't really know how to describe it other than having fun. Yeah, these films are just a lot of fun. 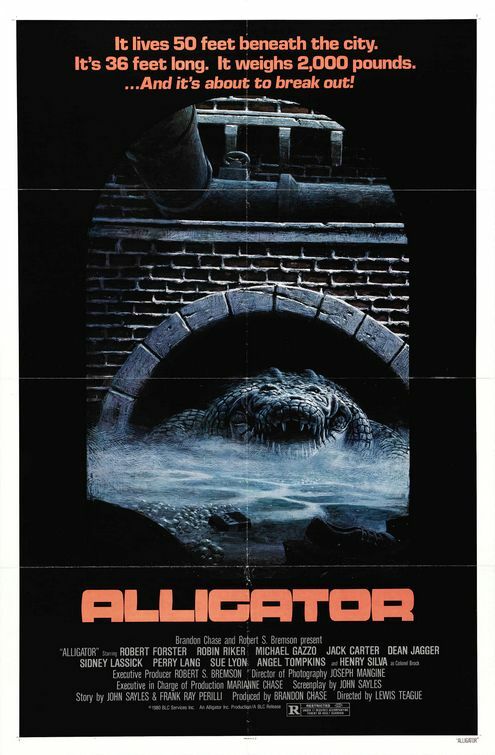 Alligator is a film that was not liked by critics when it opened. Roger Ebert gave it one star and said that the film should be flushed down the toilet. This remark, while funny, is aimed at the urban legend that birthed this film. Back in the 70s, parents in major cities across the country were buying their kids baby alligators. These baby alligators were very cute and the parents were told that the alligators wouldn't grow to full size. The kids play with their new, tiny killers until they did indeed start to grow. The parents, fearing that they would wake up one day to find that the not-so baby alligator had eaten the kids, decided to flush the alligators down the toilet. 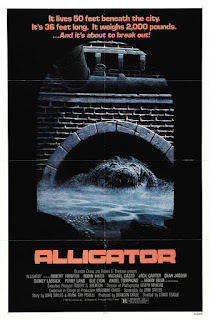 The legend concludes that the flushed baby alligators had survived the flushing only to grow into enormous alligators, bigger than regular alligators. Alligator takes this urban legend and runs with it. The film could have been one not, but Lewis Teague and John Sayles weren't going to let that happen. They have crafted a film that is both ludicrous and fun to watch at the same time. I love this film and hope that you will too.